The ALMA Director, on behalf of the Joint ALMA Observatory and the partner organizations in East Asia, Europe, and North America, is pleased to announce the ALMA Cycle 7 Call for Proposals for scientific observations to be scheduled from October 2019 to September 2020. It is anticipated that 4300 hours of the 12-m Array time and 3750 hours of the Atacama Compact Array time, also known as the Morita Array, will be available for successful proposals from Principal Investigators in Cycle 7. The Cycle 7 proposal submission deadline is 15:00 UT on Wednesday, 17 April 2019. The Space Telescope Science Institute, Center for Astrophysics | Harvard & Smithsonian, the Johns Hopkins University, European Southern Observatory, and Associated Universities, Inc. are organizing a Memorial Symposium to celebrate the life and work of our friend and colleague Riccardo Giacconi, whom we lost on December 9, 2018. The Symposium will cover the various phases of Riccardo's career and achievements. It will be held in Washington, DC at the National Academy of Sciences (2101 Constitution Avenue, N.W.) on May 29-30, 2019. The meeting website will provide information on the program, top-level schedule, SOC members, lodging options, and other Symposium details. The website is now open for registration and provides instructions for submitting requests to speak. The deadline for responding is April 29, 2019. Please visit the symposium website for more details. In advance of the ALMA Cycle 7 Call for Proposals deadline, the North American ALMA Science Center (NAASC), along with the current fifteen ALMA Ambassadors, organized ALMA proposal preparation workshops at ten different North American institutions, and two institutions in Chile, between 20 March and 8 April 2019. The radio interferometry expertise of the participants ranges from novice to expert, reaching about 240 participants in total! Congratulations to all the ambassadors for successfully concluding their events and thank you for your invaluable service to the ALMA community. On behalf of the NAASC and the ALMA Ambassadors, we wish the community great success in your Cycle 7 ALMA proposals. Workshop participants reducing their data with ALMA Scientist and Data Analyst assistance at the North American ALMA Science Center in Charlottesville. ALMA Data Reduction Workshop attendees. 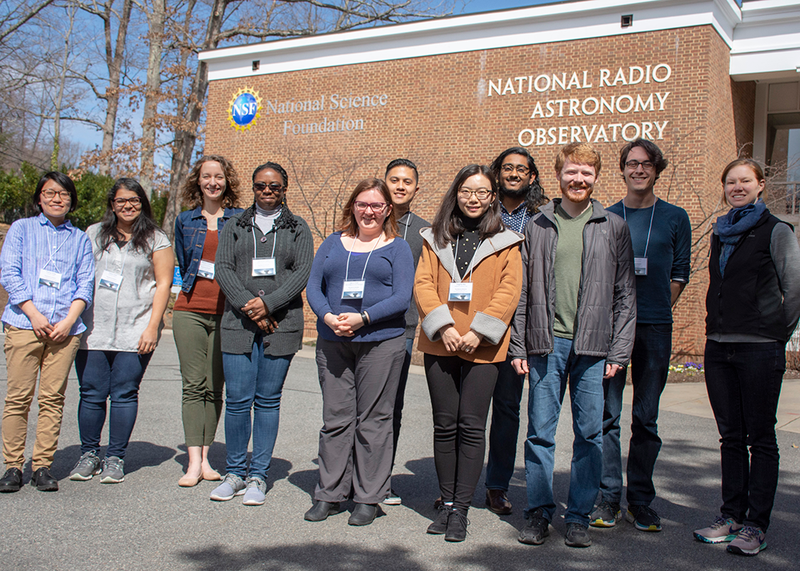 The North American ALMA Science Center (NAASC) hosted nine ALMA investigators at a Data Reduction Party at NRAO Headquarters on 13 – 15 March 2019. 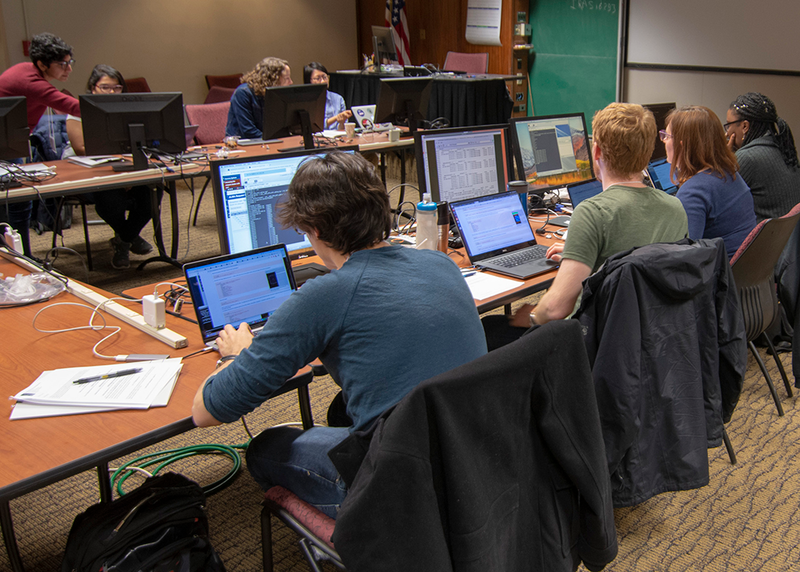 Participants worked with Assistant Scientists Rachel Friesen, Adele Plunkett, and Loreto Barcos Muñoz, and Data Analysts Tom Booth, Erica Keller, Devaky Kunneriath, Jeremy Thorley, and Sarah Wood to investigate and image their ALMA data using the NAASC's data reduction cluster. The ALMA datasets spanned a range of science topics, including protoplanetary disks and dust polarization observations, as well as extragalactic archival studies. NAASC Data Analysts prepared the datasets locally, and helped investigators understand the calibration and preliminary imaging that was done on their dataset. Presentations on the ALMA Quality Assurance 2 (QA2) process, imaging in the Common Astronomy Software Applications (CASA) package, and self-calibration were tailored to participants’ interests and science goals. Several NRAO scientific staff also dropped by to answer questions and chat. Overall, much progress was made, and we look forward to seeing exciting new ALMA results from our participants! Please stay tuned for additional workshop opportunities, and in the meantime, remember that the NAASC supports face-to-face visits for our North American ALMA users. The formal Call for ALMA Cycle 7 Proposals appeared at the ALMA Science Portal 19 Mar with proposals due 17 Apr 2019. The long-term schedule has also been published. 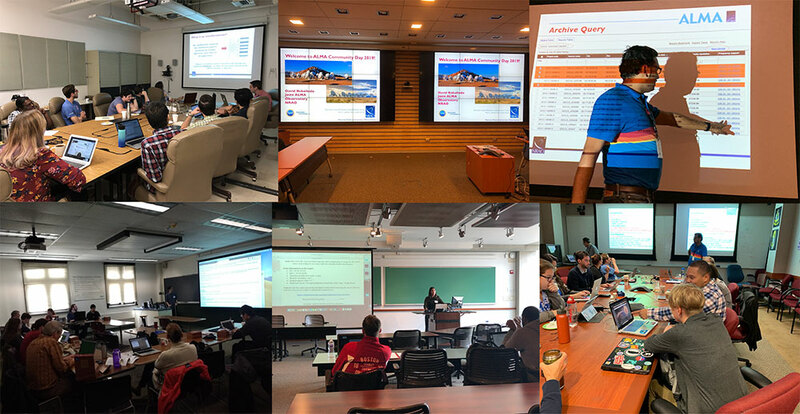 In anticipation of the Call, one-day ALMA proposal preparation workshops were held that have been designed in cooperation with institutions across North America. These twelve workshops were hosted by experienced local postdocs as part of the ALMA Ambassadors program. Cycle 6 Science Observing observations continue on ALMA, which is in its most compact configuration set. The array is currently in transition from configuration C43-2 to C43-3. Ten years after its formal acceptance, antenna DV-01 underwent maintenance at the high-elevation Operations Support Facility and has rejoined the array. Expansion to configuration C43-4 occurs late in April, followed by expansion to the largest C43-10 configuration in May. Please note that in Cycle 8, ALMA will not be moving out to the most extended baselines, C43-9 and C43-10. Proposals needing these baselines should be submitted for Cycle 7, or held for Cycle 9. A Call for Proposals for ALMA Development Studies was released 3 Dec 2018. The deadline for proposals is 1 May 2019 for funding during Fiscal Year 2020, depending on the federal budget process. We welcome any member from within the North America ALMA Operations Partnership to submit a proposal to investigate a potential ALMA upgrade (hardware, software, or advanced techniques). Particular attention should be given to ideas which may address the goals elucidated in The ALMA Development Roadmap, ALMA Memo 612. A science conference titled New Horizons in Planetary Systems will be held 13-17 May 2019 at the Victoria Conference Center in the heart of picturesque Victoria, British Columbia, on Canada's Pacific coast. This conference reviews and discusses our understanding of planetary systems from protoplanetary disks through to the Solar System, exoplanets, and debris disks. Please note the impending deadlines for registration and poster abstract submission: 12 April 2019 is the final registration deadline and the late poster abstract submission deadline. There is a hard cap on meeting attendance of 250 participants. Registrants interested in the meeting once the cap is reached will be placed on a waitlist. A science conference titled ALMA2019: Science Results and Cross-Facility Synergies will be held in Cagliari, Sardinia, Italy 14 - 18 Oct 2019. The full breadth of ALMA science will be covered, with special emphasis on results from the first rounds of ALMA Large Programs, the long baselines, and high frequency capabilities, the new Solar and Very Long Baseline Interferometry modes, as well as synergies between ALMA and other observatories. Abstracts should be submitted by 15 May 2019. Happy 50th birthday to formaldehyde (H2CO), the first detected interstellar complex organic molecule, and the first molecule discovered on an NRAO telescope. Formaldehyde was discovered in 1969 at 6 cm, using the 140-foot Telescope in Green Bank, West Virginia! 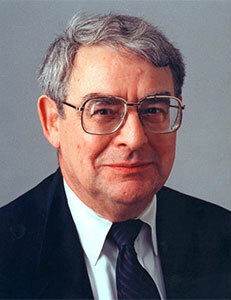 Read the discovery paper published on 31 March 1969: Lewis E. Snyder, David Buhl, B. Zuckerman, and Patrick Palmer, Phys. Rev. Lett. 22, 679. With the Astro2020 science white paper deadline behind us, and ~600 white papers submitted, there will be a broad range of exciting science to discuss during this workshop. The discounted registration deadline is 6 May 2019. Space is limited, so register today! Participation from early career astronomers is strongly encouraged. All students presenting either an oral talk (if selected) or a poster, will be offered hotel rooms free of cost for up to four nights in addition to discounted registration fees. This workshop will review the astrophysical frontiers identified in the Science White Papers submitted to the Astro2020 Decadal Survey. A particular focus will be on those science frontiers that demand observations at centimeter and/or millimeter wavelengths across all Astro2020 thematic areas. A broad range of innovative ideas and approaches will be described, and this workshop will allow those ideas to be explored in view of the current and forthcoming facilities, including the next generation Very Large Array (ngVLA). The program will be designed primarily around contributed presentations highlighting science frontiers and potential observations with the ngVLA. Such observations will additionally be discussed in the broader context of multi-wavelength and multi-messenger astronomy. Contributions from early career researchers will be especially welcomed. The oral program will go live by 12 April. The late poster abstract submission deadline will be 9 June. The ngVLA will proceed into a detailed design and development phase in 2020. The ngVLA Science Advisory Council and the NRAO aim to ensure that the ngVLA will be capable of making the measurements required to fulfill the community’s vision for radio wavelength astronomy over the next decade and beyond. Please visit the conference website for additional information. As most NRAO users probably know, the Very Long Baseline Array (VLBA) antenna on the island of Saint Croix was hit by a pair of hurricanes in September 2017. After six months’ work to restore electrical power and internet services to the island, the antenna was returned to service. 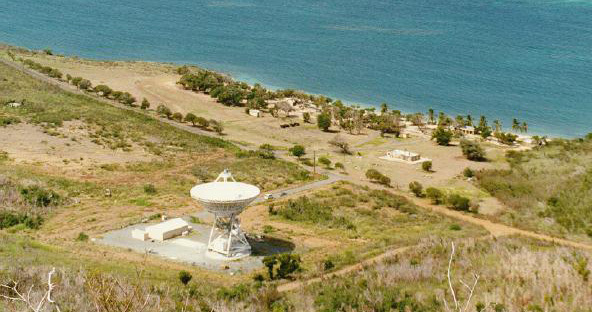 The VLBA received disaster relief funding to restore the VLBA antenna and site to pre-hurricane conditions. Some of this work has begun and has not impacted observing. A major upcoming effort will be corrosion mitigation and painting of the 25m antenna, which will require significant non-observing downtime for the station. This work will commence with an NRAO team visiting the station for structural repair work on 22 April 2019. With this visit, the station will be taken down, and will remain unavailable for observing while all repairs are made. While we cannot, at this time, give a firm date when the station will be returned to service, it is likely to be on the order of 3.5 months. Please visit this VLBA webpage periodically for updates as planning proceeds. Scientist (Open Rank): The North American ALMA Regional Center (NA ARC) is recruiting for two scientific staff positions within the North American ALMA Science Center (NAASC). The focus of these positions will be working with the NAASC Scientific Software Group on research, development, and testing of heuristics for the ALMA calibration and imaging pipelines. Activities will include working with the international ALMA Pipeline Working Group for each upcoming Cycle’s development tasks, leading the implementation of new capabilities in the ALMA pipeline architecture, and performing full end-to-end testing of the ALMA pipeline. Assistant Scientist: The NRAO is recruiting a scientific staff position to be located in Socorro, NM, the home of the Domenici Science Operations Center (DSOC), which houses the scientific, engineering, technical, computer and support staff for the Karl G. Jansky Very Large Array (VLA). This scientist position will be focused primarily on development of new VLA capabilities and technical support for VLA observations. About this month's photo: Take a Hike! 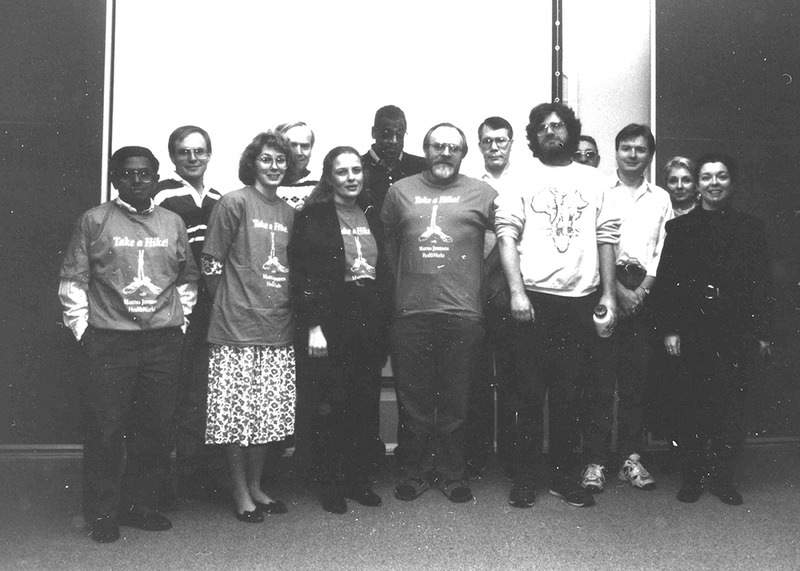 In fall 1994 a wellness program in Green Bank and Charlottesville encouraged employees to begin a regular walking program with a challenge between the two sites. 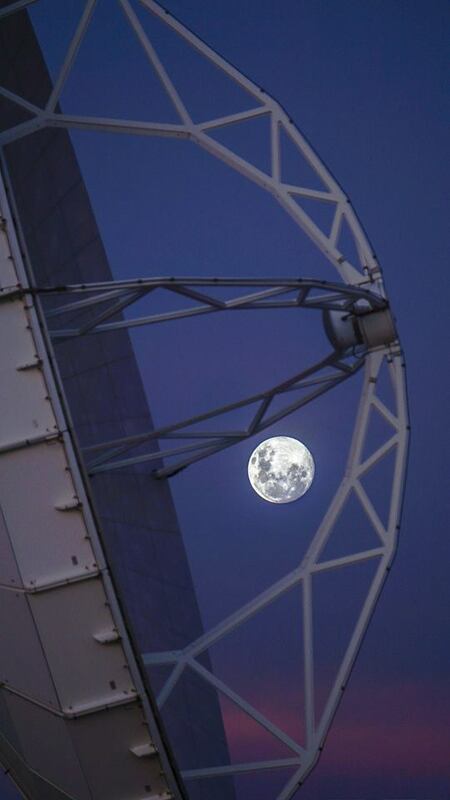 Which site's walkers could "travel" to the most Very Long Baseline Array (VLBA) antennas? Green Bank walkers won the challenge by traveling a total of 3151 miles, "visiting" Hancock, North Liberty, Los Alamos, and Pie Town (for photo, see NRAO eNews Vol. 6, #14, 17 December 2013). Charlottesville participants who walked 2564 miles, left to right: Sri Srikanth, David Frayer, Billie Jo Mattox, Bob Burns, Wendy Mahle, Ernie Allen, Gareth Hunt, Bill Wireman, Pat Murphy, Garnett Taylor, Darrell Schiebel, Toni Munch, Mary Jo Hendricks. Thanks to Pat Murphy, Mary Mayo, Gareth Hunt, Mark McKinnon, and David Frayer for help with names.